Tropical Depression Harvey in the southwestern Gulf of Mexico strengthened into a tropical storm on Wednesday, with top sustained winds of 40 miles per hour. 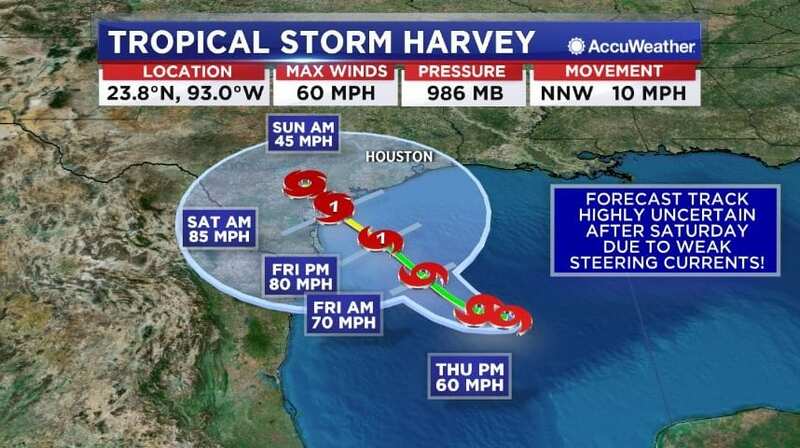 Now-Tropical Storm Harvey is expected to continue growing more powerful as it heads toward Texas, and it could hit land as a Category 1 hurricane, with top sustained winds of at least 74 mph. Storm surges and heavy rains are expected along the Texas coast. Louisiana also will get heavy rains. New Orleans expects five to 10 inches by Tuesday, and authorities are bracing for possible flooding. Some parts of New Orleans were inundated in recent rains, and crews are rushing to repair downed pumps and install backup generators at pumping stations that are part of the low-lying city’s weakened drainage system. This entry was posted on August 24th 2017 at 10:55am/10:55 and is filed under Live News Column 1, Weather & Enviorment. You can follow any responses to this entry through the RSS 2.0 feed.